I don't say this often, but I envy my clients laundry room. While touring a client’s home for the first time I was struck by a room that's often forgotten, the laundry room. It was lovely. Located on the main level, it was bright and sunny with lots of storage, plants, and personal touches. It was nothing like the typical laundry in the basement that I have. 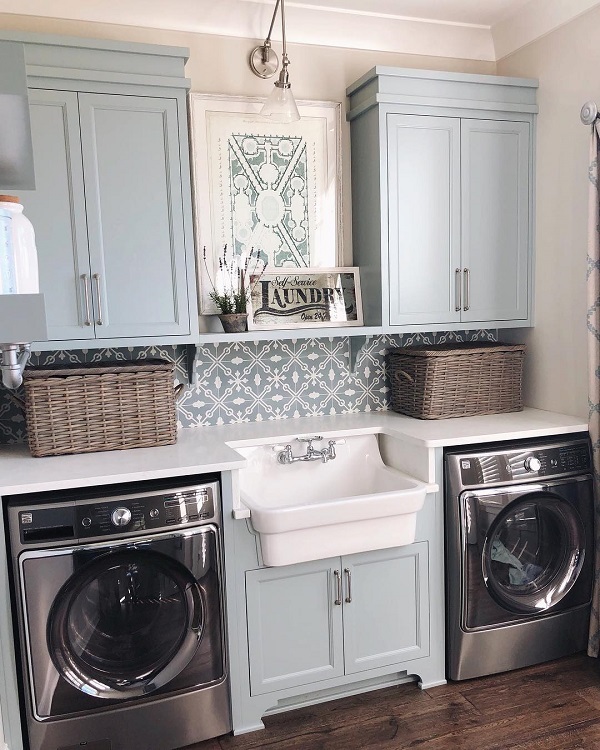 It got me thinking about what I would want in a laundry room if I were to remodel or build a new home. Taking it one step further, I started thinking about what particular features I would want to make my life easier. 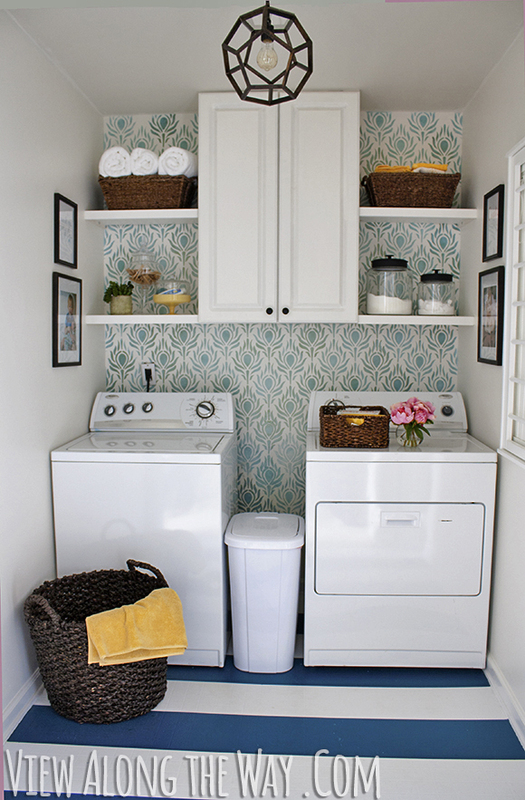 We spend a lot of time in our laundry rooms so it makes sense to make it a more pleasant place. The typical American household washes four hundred loads of laundry per year, according to the Consumer Energy Center. Even when our households downsize we always have laundry to do. 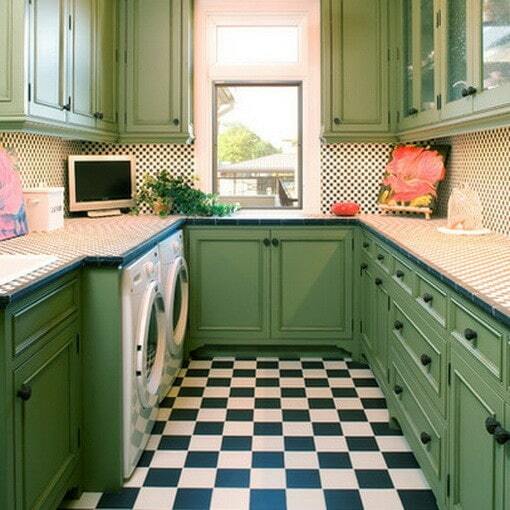 I found inspiration for my dream laundry room. 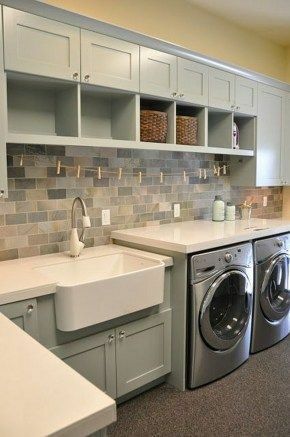 Now that I almost want to do laundry, I'm going to share with you more than 20 laundry room ideas. All with an eye on making your laundry day easier and more pleasant. 1. Locate your laundry room next to places where laundry accumulates like the bedrooms and bathrooms. 2. Remove any clutter that can get in your way or cause you to trip. 3. Widen the doorway to 36" and keep enough open space for a wheelchair or walker if needed. 4. 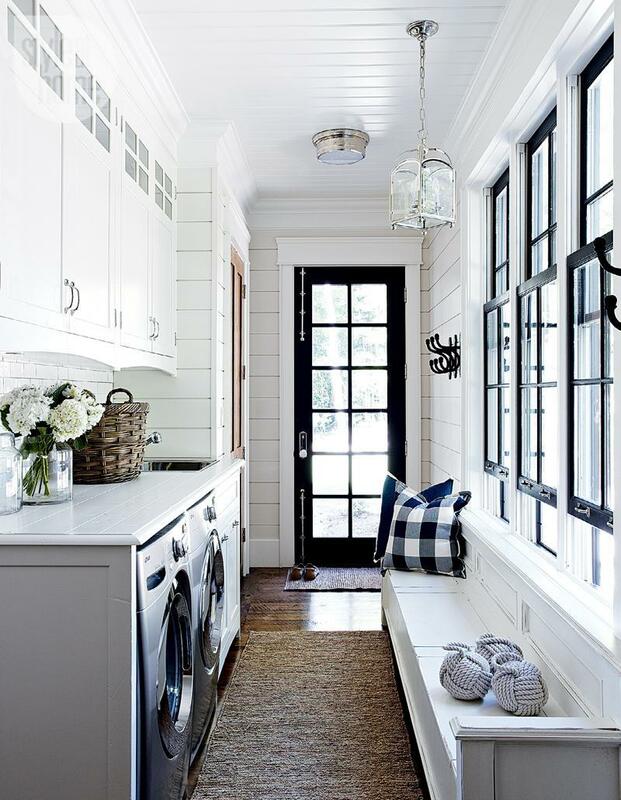 If your laundry room opens to the outside create a combination laundry and mudroom. 5. A laundry room with natural light and a views outside will keep spirits up while doing mundane tasks. 6. If your bedrooms are on the second floor and laundry is on the first floor add a laundry chute. Carrying laundry up and down the stairs is awkward and can get heavy. 7. 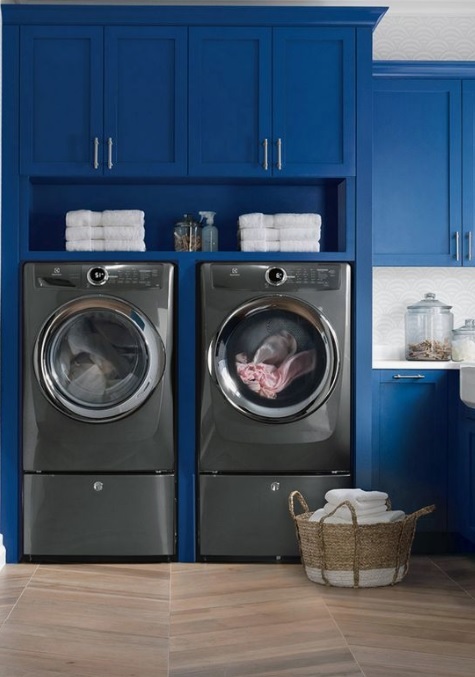 Re-purpose a hall closet with a stackable washer and dryer next to bedrooms. 8. Front loading washers and dryers are the best. Not only are they generally more energy and water efficient. You can use the space on top as a counter or to store things. 9. Have your washer and dryer installed on a pedestal. When they are higher off the floor it makes it much easier to reach the clothes inside. It also reduces back strain and is easier for someone in a wheelchair. 10. Install countertops close to your washer and dryer. This makes it easy to transfer the clothes out of the dryer to your folding area. 11. Have two countertops, one at standing height and one at sitting height with legroom. This will make your counter tops extra practical and friendly to anyone who’d like to sit and fold laundry. It also creates space to do other things like crafts, taking care of plants, or wrapping gifts. 12. Install a drying rack over the sink to drip dry your delicates. 13. Use a lever or hands-free faucet at your laundry sink. 14. Use plenty of lighting both over the laundry machines and in ironing and folding areas. 15. Laundry rooms often become dumping grounds for coats, boxes, and suitcases. 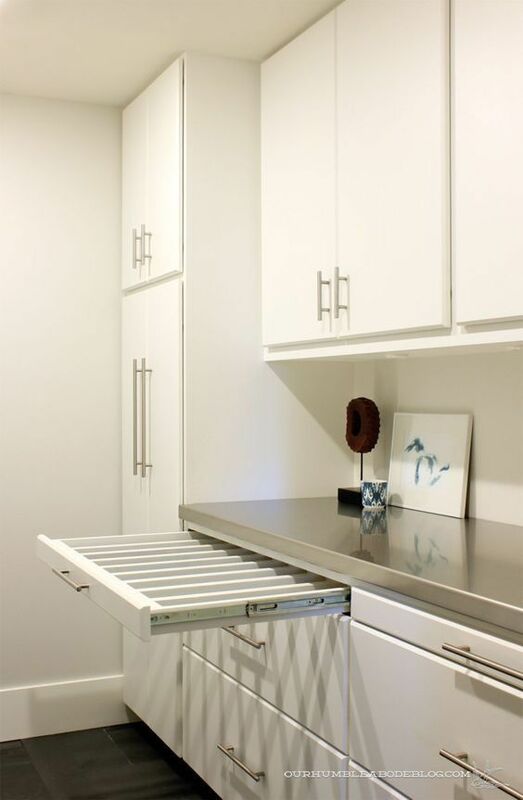 If you have the space, consider cabinetry for storing and organizing. Plus give a home to things like gardening supplies, gift wrap, pet cages, and athletic gear. 16. Use D shaped hardware to make opening doors and drawers easy for everyone. 17. If you’re low on floor space, think vertically. Install simple but effective multiple levels of shelving for your storage needs. 18. Install a pull-down shelving unit if various levels of shelving would be too high or too far to reach. 19. There are a lot of great storage gadgets for laundry rooms like stowaway pull-down ironing boards. 20. Install a stowaway pull-down ironing board at a height that you can pull up a chair to sit down and iron. 21. A window seat or bench can be a great way to incorporate extra organized storage. It also becomes a place to sit and put on your shoes or enjoy the view outside. 22. 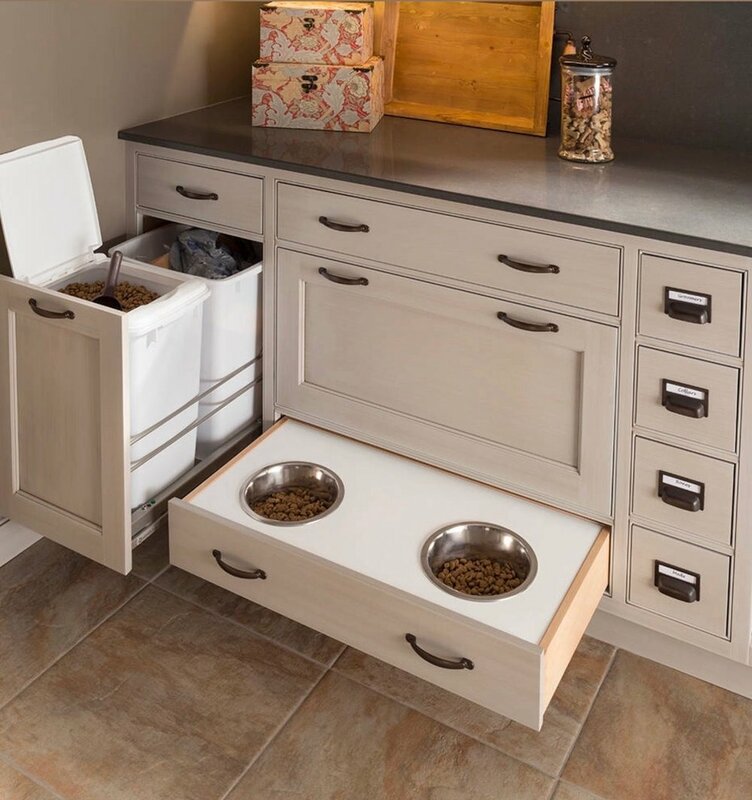 I love the idea of incorporating a pet feeding station into the laundry room. I have a feeling it might help keep a pet's weight down too. You know what they say, out of sight out of mind. 23. If you have a dog and space, include a doggy washing station. 24. Include a rolling cart or hamper to help you transfer laundry to and from the laundry room. 25. 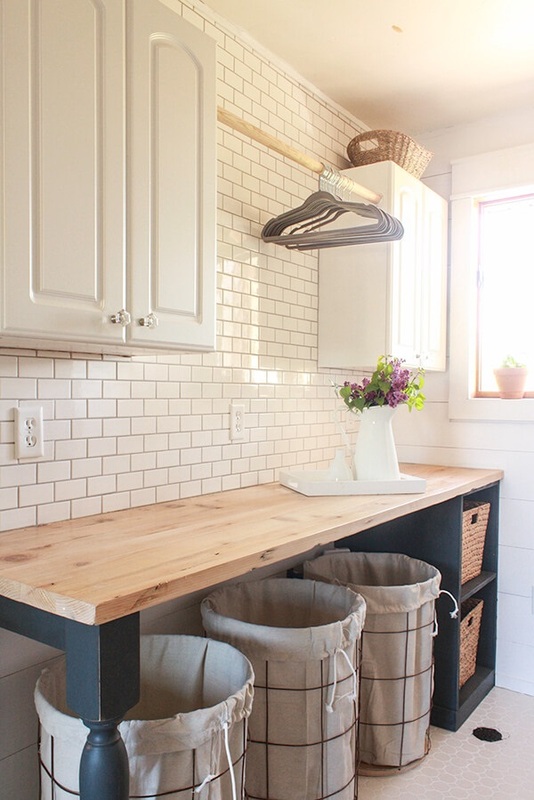 Laundry and mudrooms can be a great place to use leftover flooring material or paint. You could create an accent wall by using flooring panels on the wall. 26. Add more of your personality. Think funky lighting, wallpaper, window treatments, pretty hardware or a great backsplash. Have you ever wondered what those little symbols on clothing tags mean? Mystery solved. Let me know if this has been helpful. I wish you happier and easier laundry days ahead.